The Ferretti Group is a world leader in the construction, design and sail of luxury motor yachts. Products of excellence are sold under the brands Ferretti Yachts, Pershing, Riva, Craft, CRN and Mochi. Founded in 1968, Ferretti now has operations in Italy as well as the United States. Together with Mitsubishi, this revered motor yacht builder has developed a system called ARG (anti-rolling gyro). This reduces the effects of the waves on their boats enabling the vessels to sail quickly from destination to destination. 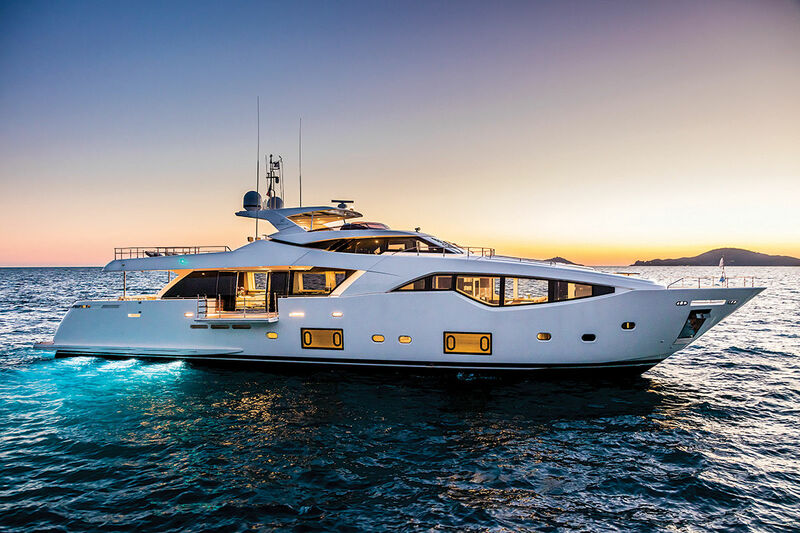 The success of Ferretti yachts goes on among owners and charter enthusiasts. The Ferretti yachts 450 were named the best motor yacht below 55ft at the China International Boat Show in Shanghai. Ferretti Yachts was founded in 1968 by Alessandro and Norberto Ferretti and produced its first yacht, a motor sailor, in 1971. The prominent yachting company now focuses entirely on the powerboat / motor yacht sector, and specializes in luxury motor yacht production. Ferretti Yachts is a division of the Ferretti Group and the company produces stylish, modernistic and well designed fly bridge motor yachts from 14 to 27 meters in length. You can see some of the Ferretti yachts available for charter below. • FERRETTI YACHTS – as per above. • CRN Yachts - luxury superyachts made from composite materials from 39 to 43 meters with 3 decks and also larger steel super yachts from 46 meters and up. • FERRETTI CUSTOM LINE - super yachts in composite materials from 30 to 34 meters with two decks. • PERSHING - high performance open style sport yachts from, 11 to 35 meters. 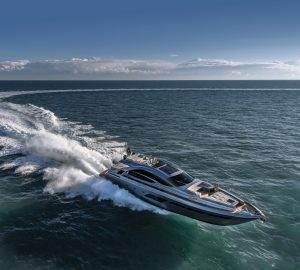 • ITAMA – open style motor yachts from 13 to 23 meters. • BERTRAM YACHTS - sport fishing motor yachts from 12 to 22 meters. • RIVA YACHTS – classic inspired open and fly bridge motor yachts, 10 to 35 meters, sometimes used as tenders to large mega yachts. • MOCHI CRAFT - classical 'work boat inspired' luxury fly bridge yachts. Ferretti yachts (Ferretti S.p.A.) is one of the leading Italian companies in the design, construction and sale of smaller superyachts. Founded by Norberto Ferretti in 1968, Ferretti S.p.A. is in the forefront of the nautical industry due to its penchant for constant product and process innovation and continuous technological research. Ferretti Luxury yachts are developed by a team of around 90 engineers and designers and built in the group’s 25 production units. Over 3,000 employees, led by Chairman Norberto Ferretti and CEO Salvatore Basile, share the same continuous strive towards quality, technological excellence, top performance, exclusive, and innovative design, maximizing comfort and attention to details. The group is surely changing the yachting industry with its vision to make customer’s dream come true. It works with a mission to achieve excellence before, during and after the purchase of the world’s best flying bridge motor yachts. The history of the Ferretti shipyards begins in 1968 when Norberto Ferretti's passion for the sea inspired his brother Alessandro. They together began an adventure that would lead them to become one of the most prestigious shipyards on the world stage. They began with selling well-known boats such as Chris Craft, San Lorenzo and Italcraft, to the decision to begin a company of their own. The boats they sold were beautiful, but they did not fully express that sailing philosophy of Norberto. In the year 1971 Ferretti manufactured its first 10-meter wooden “motor sailer” boat but the wish of innovation, limited to the features of sailing boats, led Ferretti brothers to seek to fulfill their desire of improvement. At the beginning of the 1980s the Ferretti brothers decided to embark upon the world of motor yachts. The era of 1990s were characterized by a series of commercial and financial activities designed to affirm the name of Ferretti on the seas all over the world. 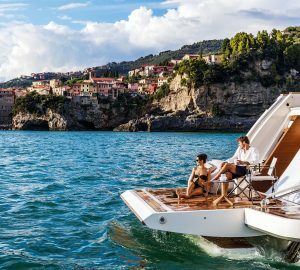 Ferretti Yachts division was created in September 2002, a historic brand of the group, production and marketing fibreglass fly bridge boats from 47 to 88 feet. 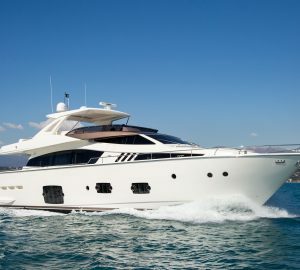 Since 1st of September 2006 the team Ferretti Yachts has also been dealing with the management of the brand Custom Line. And with this in the year 2008 Ferretti Yachts celebrated its 40 years of history. Ferretti shipyard focuses on the evolution, innovation and design of new luxury motor yachts. It also introduced the ARG system, developed with Mitsubishi, and the large open-view window of the ship owner's cabin in almost all models in the range is the company’s forte. Within the Group, a specialized team follows the creation of each vessel, assisted by the AYT Division - Advanced Yacht Technology - that deals with new concepts and fine-tuning extremely innovative solutions. In addition, the Ferretti fleet is also renowned for being the first to adopt the new revolutionary generation of Common-rail engines. A new, important technological innovation: FAIR (Ferretti Analysis Integral Recorder), is the very first integrated system for monitoring the performance of group yachts during testing, enabling not only simultaneous acquisition of operating data, but also their analysis and processing. Luxury yacht by Ferretti received numerous awards over the years, with two of the Ferretti Yachts, 510 and the Navetta 26 Ferretti Custom Line receiving the Millennium Yacht Design Award (MYDA) at the Italian shipbuilding show Seatec 2008. Ferretti Yachts 510 was chosen by the MYDA jury as the best model in the "New 15m-24m (49ft-79ft) motor/fly craft" group, while the Navetta 26 took the award for the over 24m (79ft) range. Today, the Ferretti yacht sales are international and inludes Europe, the USA, the Middle East and the Far East. The constantly developing foreign markets are safeguarded by a widespread network which continues to expand and represents one of the strategic strengths of Ferretti Yachts. Ferretti motor yachts are great to charter with their graceful style, practical design and unparalleled on-board comfort. The dynamically versatile interior layouts add to the excitement of sailing to worldwide destinations such as the Caribbean, Mediterranean, Asia Pacific and the Indian Ocean. Ferretti luxury motor yachts are synonymous with excellence and technological innovation. They are harmonious in design offering a wonderful mix of timeless appeal, perfection and attention to detail. Comfort for passengers is a top priority on board Ferretti vessels. This covers smart design, acoustic insulation of the engine area and air conditioning in each room. All available space is optimised thanks to the architects who work with Ferretti Yachts to create modern and functional superyachts. There’s every amenity you would expect on board both inside and out. Specs are equally as impressive. They not only offer the ultimate in comfort but high performance for those who want the very best and smoothest cruising experience. To date, Ferretti works with 60 yacht charter brokers and dealers globally. They are a well-known, highly recognisable and a respected name among the charter superyacht fraternity. Below are some of the Ferretti yachts available for charter worldwide as well as the latest news related to Ferretti.